Five years after the fourth UN world conference on women in Beijing, the UN General Assembly held a Special Session in New York City entitled Women 2000: Gender Equality, Development and Peace for the Twenty-First Century. The Special Session reviewed and assessed the progress achieved in the implementation of the Nairobi Forward-Looking Strategies for the Advancement of Women, adopted in 1985, and the Beijing Platform for Action adopted at the 1995 Fourth World Conference on Women in Beijing. On the eve of the Special Session (June 4, 2000), the Center for Women’s Global Leadership (CWGL) organized Women 2000: A Symposium on Future Directions for Human Rights in an effort to influence the Beijing + 5 deliberations. 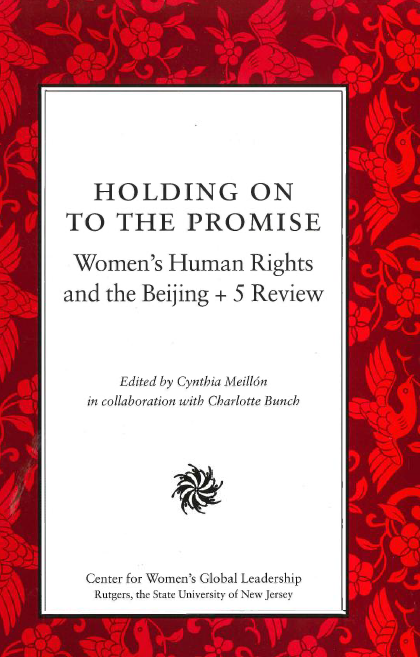 The Symposium presentations and an analysis of the Beijing + 5 proceedings are contained in a book published by CWGL called “Holding on to the Promise: Women’s Human Rights and the Beijing + 5 Review.” The overriding impression from this event is how much women’s human rights advanced in terms of recognition and even acceptance during the 1990’s, and yet, implementation and realization of these rights are stalled and backlash is ever present. Beijing was the last world conference on women to date, but the CSW has conducted widely attended reviews of implementation of the BPFA at five- year intervals since then. These events reaffirmed the platform but only after considerable controversy, and they added to it in only in limited areas, such as HIV/ AIDS. The BPFA reviews have been less bold in spirit than Beijing, however, and reflect the impact of conservative forces on women’s issues, es­pecially in areas like sexual and reproductive rights.